The fairgrounds in Stockton are dotted with historic buildings built of native limestone dating back to the 1930s WPA era. By far the largest structure on the grounds is the grandstand built in 1937. The grandstand when originally constructed was large enough to accommodate over 3,500 people. The retaining wall built around the west end of the track, the horse barns, and other exhibition halls on the fairgrounds are also constructed of native limestone and built during the same time period. 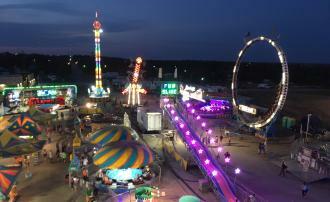 The Rooks County Free Fair has been a fixture of Rooks County entertainment since 1879. Started as a means of exhibiting livestock and crops, the fair has continued through the years to be a culmination of the efforts of kids and adults alike to exhibit their wares. Popularly known as "The Fair of Champions," the fair has continued to be one of the largest county fairs in the state of Kansas. The fair was permanently named The Rooks County Free Fair in 1951. Through the years, the fair has hosted many dignitaries such as former presidential candidate Alf Landon, and Governor Frank Carlson, as well as famous entertainers such as Martina McBride, Conway Twitty, and Chris LeDoux. In 2004, the The Rooks County Free Fair celebrated its 125th anniversary with many special events.